Posted byMei 22 October, 2014 16 September, 2014 Leave a comment on Eczema News – Tattoo and Eczema – is it worth the Skin? Tattoo has been rising in popularity – from TV shows, to ordinary persons in the gym! You see them (almost) everywhere and it’s no longer the ‘hip’ or ‘happening’ guys and gals who tattoo. How does tattoo affect your skin barrier? Will tattooing lead to skin rash/eczema and can eczema sufferers have tattoo? This is a NEW topic we’re exploring and one that although not applicable to kids, we never know how popular tattoo will be and how (young or) old it will be considered norm/OK/cool to have a tattoo! Tattoo works by damaging the skin barrier. The (permanent) kind of tattoo involves depositing the tattoo pigment via needle into the dermis. The dermis is NOT the top skin layer, but instead the second layer, i.e. the needle penetrates the epidermis, the dermal-epidermal junction, into the dermis. Wound and trauma is caused to the skin barrier. The wound needs to heal – the better it heals, the better the tattoo and overall surrounding skin will look. The body generates an immune response to defend against the pigment and in the process, lock the pigment permanently. In certain states (in US), the law prohibit operators tattooing on the affected skin lesions for eczema and psoriasis patients. There are instances of discoloration of the tattoo and thus the patient/customer has to moderate his expectations and the tattoo artist has to be told about the skin condition. 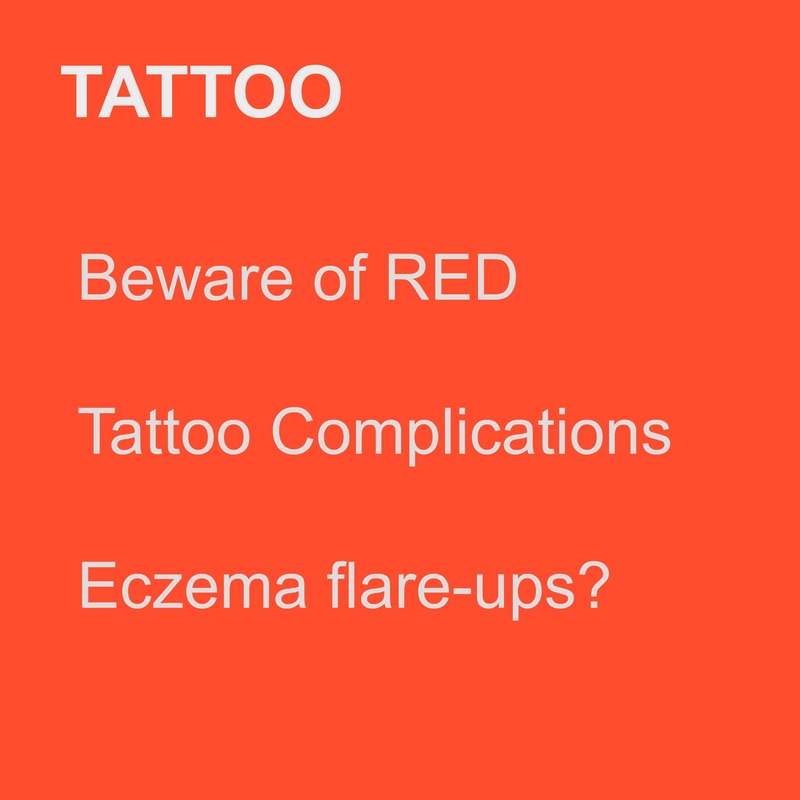 Apart from the tattoo not appearing as it would on normal skin, there is also a risk of eczema flare-up (not limited to the tattoo-ed skin). The healing process may take longer or be more painful for those with pre-existing skin conditions. Allergic/ Irritant contact dermatitis – The skin can be sensitive to the tattoo pigment used. According to American Academy of Dermatology, the type of ink had evolved from metal sales, lead, cobalt and carbon to organic azo dye with plastic-based pigment (which are also used in industrial printing, textile and car). While Patch Testing is recommended where the pigment is first ‘patched’ on the skin and left for 48-72 hours to observe any reaction, organic dyes which are insoluble may not trigger a hypersensitive reaction. Thus, one may falsely assume his/her skin will not react to the dye, but when the dye is impregnated into the skin barrier, a hypersensitive reaction occurs. The symptoms of allergic skin reaction are itch, rash, scaly, flaky or bumpy. If scratched, it is also prone to skin infection. Sometimes, these symptoms are not immediate but may take months/years to surface as the body gradually develop a delayed hypersensitivity response to it or when it comes into contact with cross reactants (e.g. thimerasol). The level of itch and discomfort is significant – in a study of 40 patients, it was shown to be comparable to that faced by patients with psoriasis and eczema. Granuloma (small, red raised bumps) can significantly alter the aesthetics of the tattoo. Of the pigments, the red pigment seems to trigger the most hypersensitive reaction due to the content mercury sulfide (cinnabar). Other components of the red pigment are ferric hydrate (sienna), sandalwood or brazilwood. All other colors are also able to trigger hypersensitive skin reaction. Black pigment uses carbon (india ink), iron oxide and logwood. Blue pigment is colbalt aluminate. Brown pigment is ferric oxide. Green pigment is chromic oxide, lead chromate and phthalocyanine dye. Purple pigment is manganese and aluminum. Yellow pigment is cadmium sulfide. White pigment is titanium oxide and zinc oxide. Photo-allergic dermatitis – This refers to skin inflammation (swelling) after pigment’s exposure to light. The colors most associated with this sort of photo-sensitivity are red, brown and yellow. Lichenoid – A delayed hypersensitive response, mainly from mercury in red pigment that led to papules or plaques forming (lichen planus reaction). Pseudolymphoma – Common with red pigment, where delayed hypersensitive reaction result in red nodules/plaques. Sarcoidal (Köbner) Granuloma – These are itchy and (swollen) bumps that appear underneath the skin and thus modify the look of the tattoo, a form of autoimmune disorder. Keloid – Large, raised scars that alter the appearance of the skin/tattoo. MRI sensitivity – Certain pigment in eyeliner tattoo ink can trigger hypersensitive skin reaction should the person undergo a MRI scan. Tattooing being increasingly popular also leads to more artists operating from their home. Beware though as home artists may not follow the requirements expected of a licensed artist (on sanitary, request for client’s information, recording of pigment used, wound care, needle disposal). Do not be afraid to play safe – as seen above, the complications can be severe. Ask to see sterile packaging in original form, INSIST on sterilization, if you have a skin condition, let both your dermatologist and the artist know. As mentioned before, ask for the batch number of the ink used on you. Explore the use of safer chemicals or colors and consider patch testing before tattooing. Do not tattoo over a mole because the change in appearance of moles is a key ‘warning’ sign of skin cancer. Is Temporary Tattoo then Safer? No, for henna dye that contains paraphenylenediamine (PPD), it can cause severe allergic reaction. It is also known as black henna, which is pure henna mixed with PPD. I looked up Pubmed for possible research but most reported isolated or very small scale studies, mostly on what has been covered above. Of emphasis is that patch testing turned up negative for people who eventually had a positive hypersensitive reaction to red pigment, thus patch testing doesn’t fully cover ‘better be safe, then sorry’. The safest is not to even tattoo.